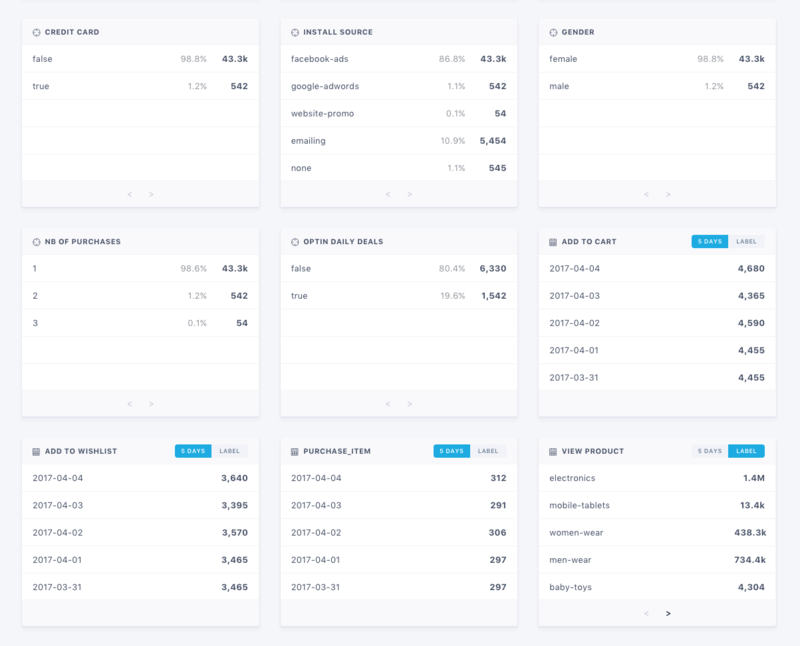 The userbase tab gives you a complete overview of your current userbase, allowing you to elaborate new push strategies and understand how to best engage with your users. Basic statistics: Total number of users, opt-in rate, etc. Smart Segments: Distribution of your users in Batch Smart segments. Native and custom segments statistics. Newly tracked attributes, tags and events are hidden by default. You will need to manually display them from the dashboard settings > "Custom data" tab. Total number of installs of your app since you released it with Batch SDK. This number includes users who still have your app on their device or who already uninstalled it. The number of users is updated in real time, only for the Live API key. Number of users who have opt-in for push notifications. On Android, this percentage should be arround 100% since users are automatically opt-in. In some cases it's a bit lower due to minor issues (network issues, reinstalls, etc). On iOS, it's your opt-in rate: the number of users who have opt-in for push notifications, if background refresh is enabled in your app. On Android, Batch retrieves automatically the token of your new users. Users who have a token are users who still have your app on their device. On iOS, the token collection can depend on the background refresh. You can go in Xcode and see if "Remote notifications" is checked as a background mode in your app's Capabilities to see if it's enabled. If enabled: Batch collects tokens for all your users, even for those who choose not to receive push notifications. In this case, users who have a token are also users who have your app on their device. If disabled: Batch only collects tokens for users who opt-in for push notifications. In this case, users who don't have a token are users who didn't accept notifications or uninstalled your app. Please note that users can disable background refresh for your application so these stats may be imprecise. Smart Segments are automatically created by Batch using advanced machine-learning. They let you visualize precisely who is using your app, and who is not, who is buying your product, and who is churning away. New: Newcomers to your app that haven't yet established themselves as engaged, lasting users. Engaged: Congratulations! These users are actively using your app. Dormant: These promising users haven't used your app in a while. Reengage them! One-time: Users that have had your app for a while but have only opened it once. Risky Engaged: Users with a high risk of becoming dormant in the next days if you don’t re-engage them with a targeted notification. Promising New / Dormant users: Users who are about to become engaged. Don’t miss the opportunity to send them a message! Batch also shows the number of imported tokens who haven't been reintegrated to Batch Smart Segments yet. You will find more information on token import here. You will find more information on Smart Segments targeting (for Premium users and higher) here. 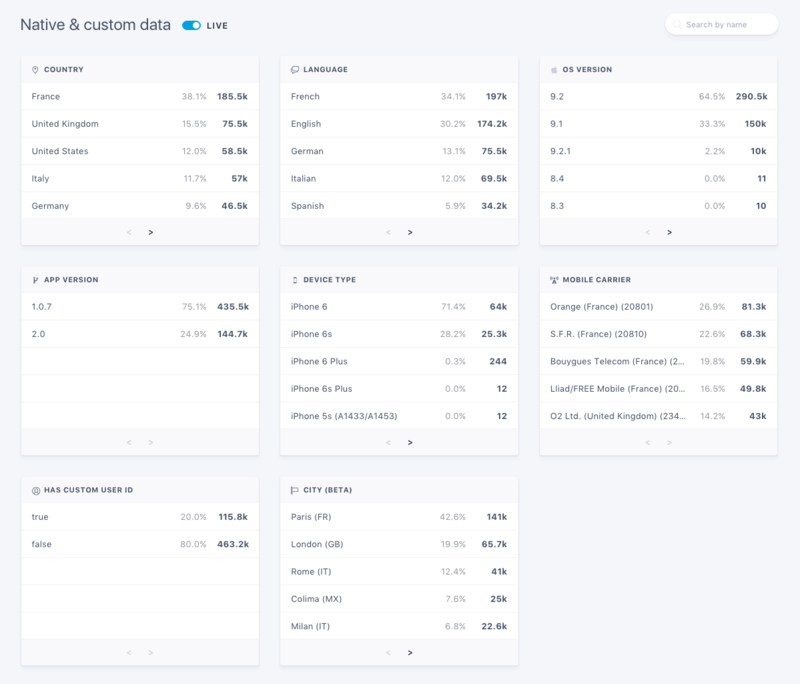 Batch's userbase analytics also allow you to see how your users are distributed in the different segments of your app. You can use the Dev/Live toggle in the top right corner to see the data received from apps built with the Dev or the Live API key. Users of the Free plan have limited access to that data. Region / Language: Localize the content of your push notifications in a specific language. Custom user identifier: See how many users are logged in in your app. OS version / App version: Invite your users to update your app if an important part of your userbase is still using an old version. Device type: Keep supporting an old model of Android/iOS device. Mobile carrier: Know which carrier are using your users. Custom identifier: Know how many users have a custom ID (iOS/Android). This may be useful for apps with login walls or that require an account to make significant actions (purchase, etc). City: Know in which city most of your users are living. Batch uses Wi-Fi-based geolocation to find the city of your users. See here to know more on Batch native attributes. Batch allows you to create your own segments based on custom data (attributes, collections of tags and events). This is useful to see what your users are doing in your app, which feature they are using the most and more. All you need to do is to tag your app first. Then you will be target these specific segments from the dashboard or the API. You can take a look at our guide to know more on custom data and learn how to tag your app.